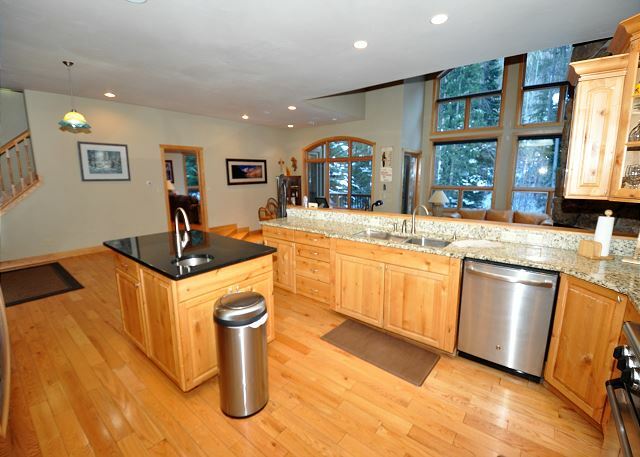 Property Video Managed by Gore Creek Properties, this luxury platinum rated private home has 4000 square feet and is located directly on the Gore Creek in East Vail just 4 miles from Vail village. 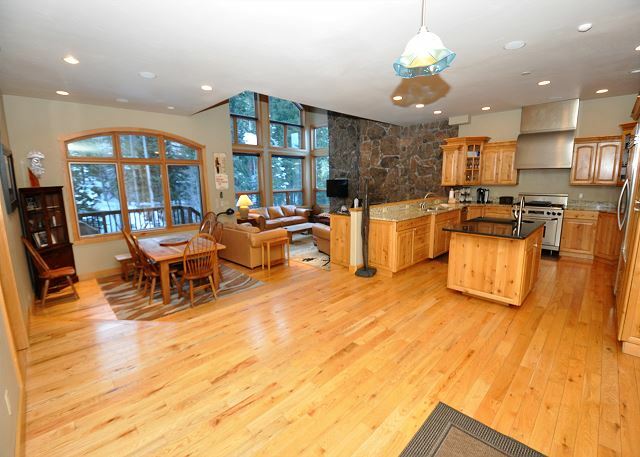 The views of the mountain and the river are absolutely outstanding from the large deck outside. 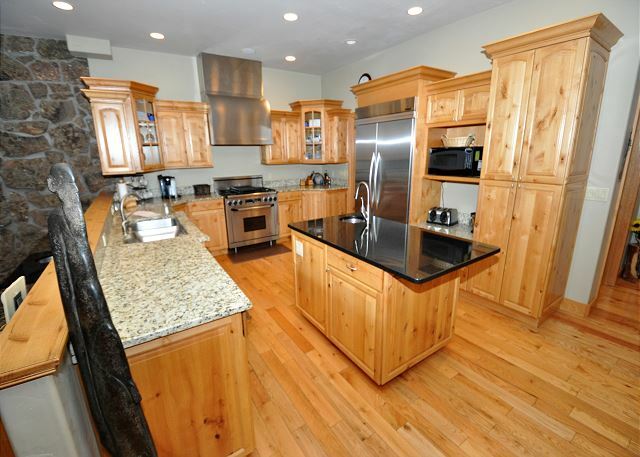 The home has 5 bedrooms and 6 bathrooms and will accommodate up to 12 people. 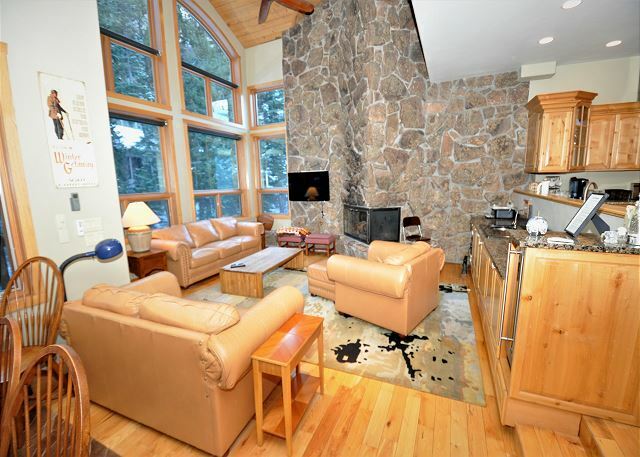 It has an extremely large gourmet kitchen and a gas fireplace in the spacious living room. 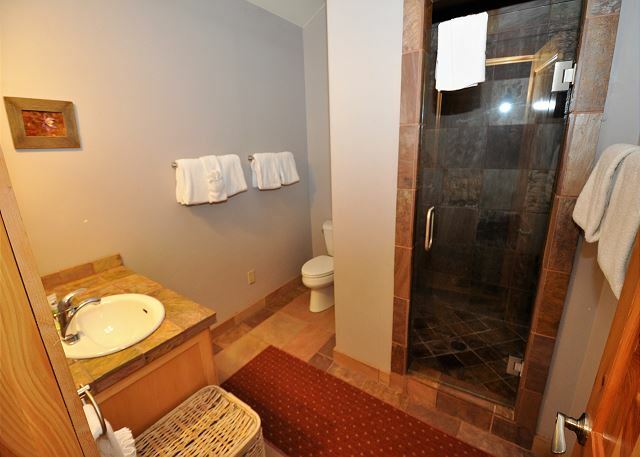 There is also a meditation room, a Jetted bath tub and a steam shower. There is room to park 4 cars behind the garage.. The free shuttle stop for the bus which runs every 15 minutes into Vail is just outside the house. This is an extremely high end home and is situated in a perfect setting for your unbelievable vacation whether it be winter or summer. This property does not allow any pets and is wheelchair accessible. This is a NON SMOKING property. We could not have asked for a more perfect place for 13 family members to celebrate my father’s milestone birthday. This home is absolutely stunning, especially the living room with its huge, two-story picture window and the kitchen with granite counter tops and high end appliances. The open floor plan (entry way, kitchen, dining room, living room) made it easy for us to spend time together in larger and smaller groups. The kitchen was incredibly well-stocked with plates, glasses, cups, flatware and cookware, even a Kitchen Aid mixer that we used to bake a birthday cake. 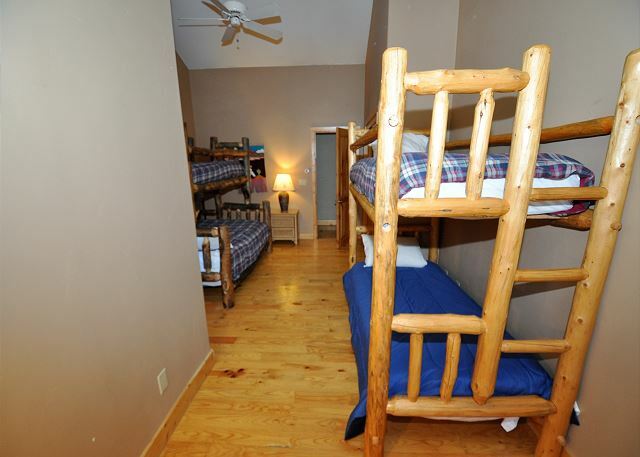 The bedrooms were comfortable and quiet. We were able to adjust the temperature settings in the bedrooms so that my sister from Arizona could keep her room warmer, while mine was cooler. 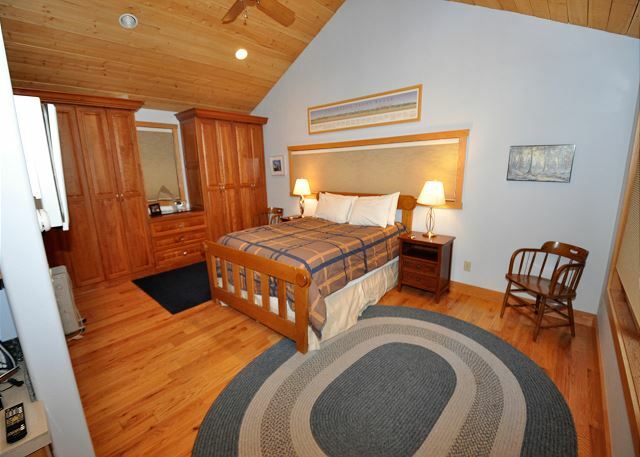 Four of the bedrooms had adjoining bathrooms; the bathroom for the other bedroom was right across the hall. 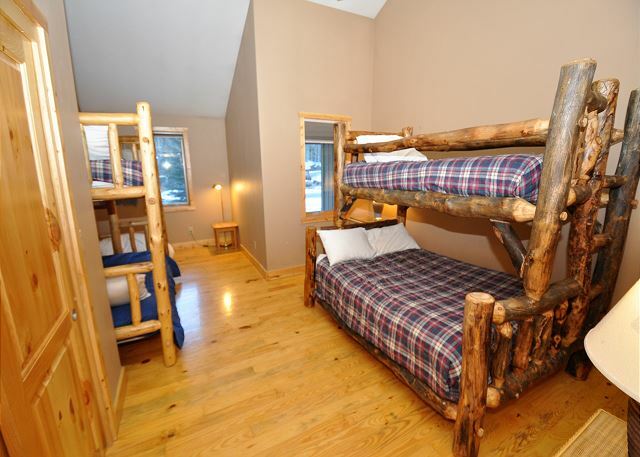 If two people slept in the lower bunk that appeared to be a full size bed and one person slept on the sofa bed in the family room, the house could actually sleep 15. We also appreciated the heated driveway: No need to shovel and the driveway had no ice or snow at all despite the weather. 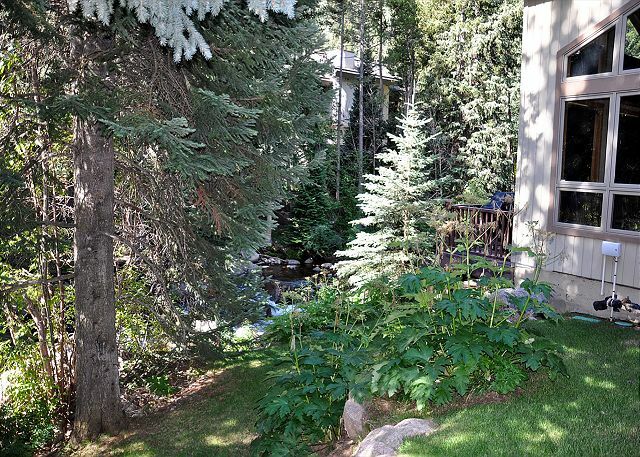 The home’s location is ideal, in a quiet location with a creek behind it, approximately three houses down from the East Vail bus stop. Gore Creek was a pleasure to deal with. They are helpful, honest, and quickly problem solve any issues that occur with the homes they rent. (This house was perfect. We had no issues.) Thanks so much for sharing your home with us and for a truly memorable vacation. We’re so appreciative! We had an amazing holiday trip, the house was great. Gore Creek Properties did a great job, we would stay with them in the future. WE HAD DINNER AT RUSSELS AND THE BOTEGGA BOTH WERE DELICIOUS AND WITH A GREAT SERVICE. WE ALSO WENT TO THE OSAKIS RESTAURANTE. WE DIDN'T LIKE IT AT ALL, THE SERVICE WAS NOT VERY GOOD. We had 12 in our group (6 kids and 6 adults). 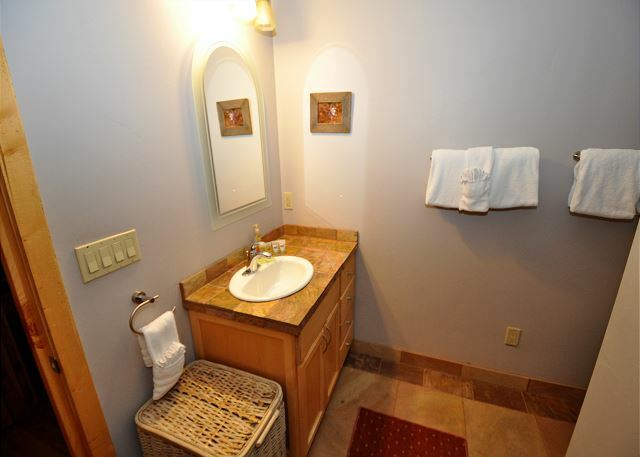 So much space and a more than enough bathrooms. Love the heated floors. Staff were wonderful. 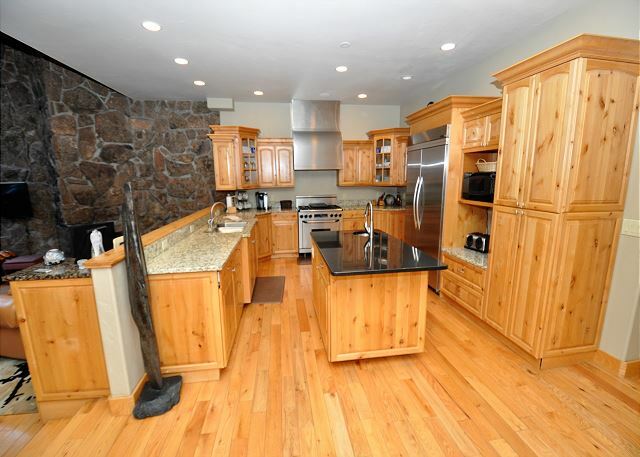 Kitchen had super large fridge and stove and great dishwasher. Family members from several states met in Vail for five days. The property was wonderful. The location was awesome. We spent hours sitting on the deck watching and listening to the creek that runs behind the house. The house was clean, beautiful and homey. We grilled/cooked several meals and sat down together to for meals. We relaxed and got to enjoy each other's company. Enjoyed staying in this very comfortable duplex but there were some things that weren't good. Not enough storage for renters in master bedroom - only 3 drawers available, all others either locked or full. Not enough room in kitchen cabinets for our food. Should have 1 more tv - preferably in meditation room. Management company was very helpful. This house was absolutely perfect for what our work group wanted to do - some relaxation and work in a relaxing environment. The WiFi connection was also strong, which was a huge plus with this being a work retreat. Perfect "Location.Location, Location" plus lots of space! 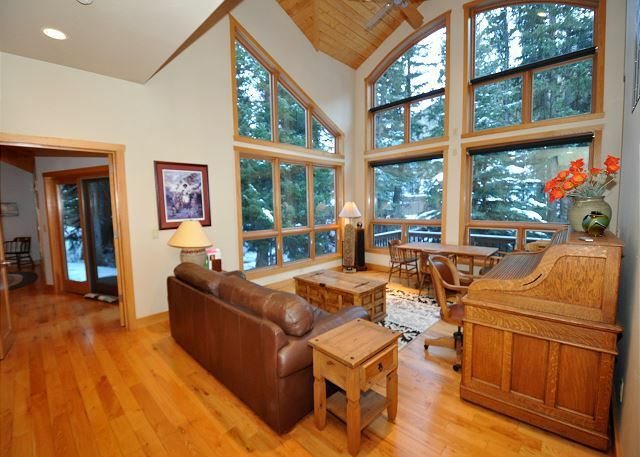 We took our two kids and their families(6 adults, 5 grandkids) to this home for a Christmas --New Years ski vacation. It will be a cherished experience. 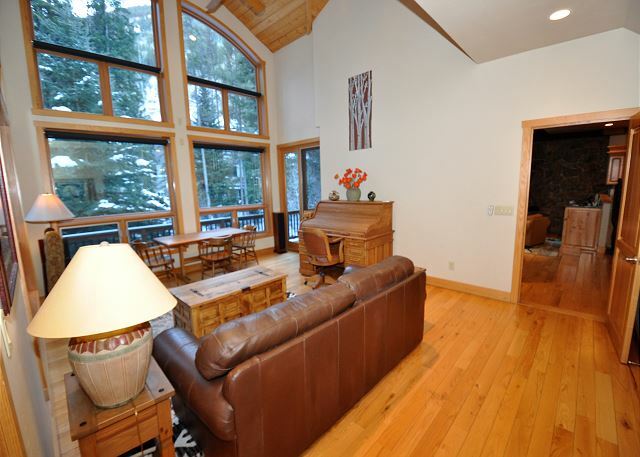 First of all, Tere of Gore Creek Properties was a pleasure to deal with from the booking to fixing a couple of minor issues after we arrived. 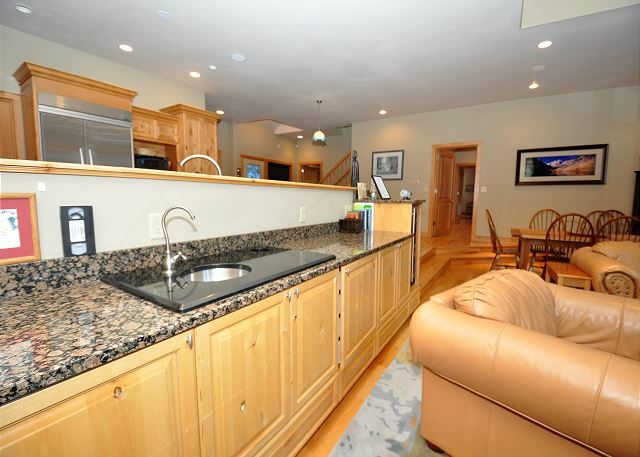 Everything was as described and the house was beautiful and spacious. The "meditation" room doubled as an office to quietly keep up with business during the day and as a sixth bedroom(the couch has a pullout bed) for a teen who deserved his own space at night. 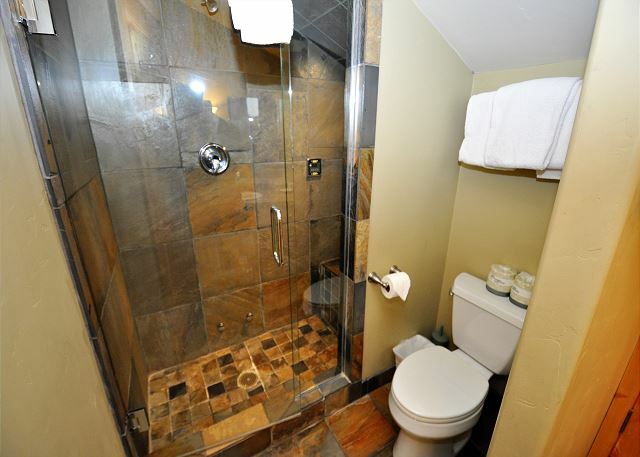 I wish the owner had left written instructions on how to use the walk-in jacuzzi tub, the steam shower, and the sound system. My techie son discovered that the Canon printer on the entertainment counter in the living room is an "air printer" so we were able to use our iPhones to print boarding passes. 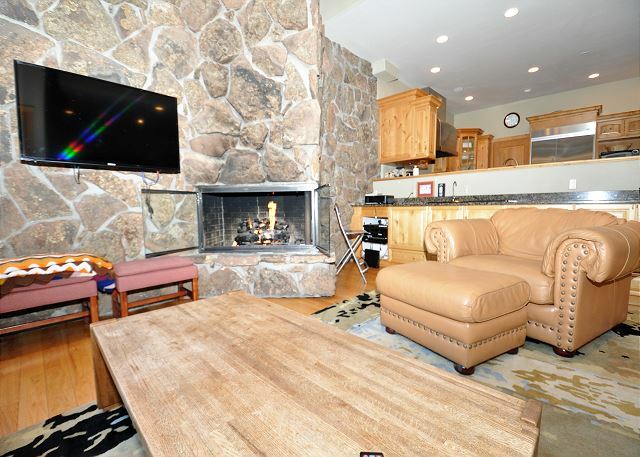 The gas fireplace is controlled only by a remote control by turning the "Mode" button to "On". The glass sliding door opposite the master bathroom doesn't have window treatment so be aware that the home on the opposite side of the stream is occupied! The home is steps away from a shuttle bus stop which was very convenient and free (the Lions Head parking lot is $25 per day but for dropoffs the first two hours are free). When we go back to Vail we will absolutely use Gore Creek Properties again. The house was well prepared for our visit. The house functioned well. 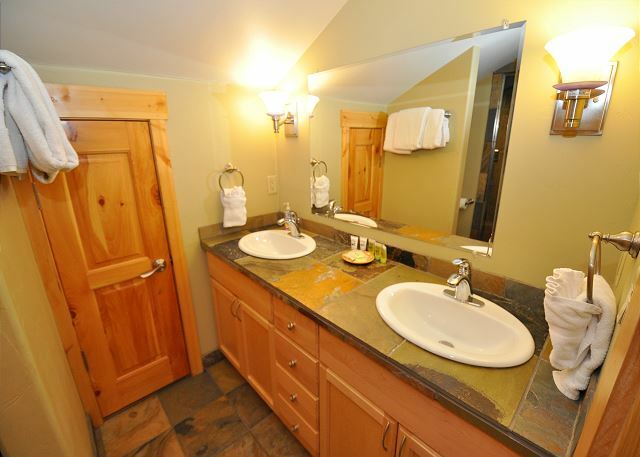 Allround a 5 star experience with a very good ski resort. Property was in great shape. Very clean, modern, and comfortable. 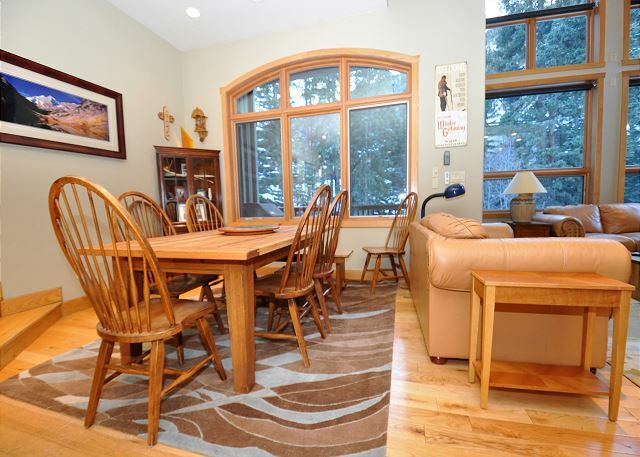 I hosted 8 client guests and had no issues with the property or the management company. The bus stop is a short walk from the house as advertised. I have no issues staying here again.